Our Town – Some Random Thoughts – my books. my life. I can’t write a proper review of Our Town. So let me just tell you how it made me feel. When Ben really wants me to read a play he loves, we usually read it together. He assigns each of us various roles and we read it aloud. It is both nerdy and pretty adorable. Which describes us well. 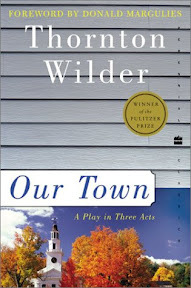 Anyway, we read Our Town this way as a break during the last 24-hour Readathon. And we had a wonderful time. I mean, seriously, you are just going along reading a play and – BAM – that line hits you. And you can’t help but stop a moment. And maybe sigh. And realize the greatness of that sentence. Our Town made me think. It made me grateful that we have people like Thornton Wilder who can capture something so perfectly. It made me grateful I have someone like Ben to share it with. I promise to stop gushing if you go read it right now. Deal? My husband and I actually saw this play at a small theater about 2 years ago. It was so moving, and the actors who were cast were perfect for the roles. Such a sad, but meaningful play. Glad you liked it too! I felt the same way about this one. I saw it on stage and just fell in love with the simplicity and earnestness of characters. I read it later and loved it just as much. I read this one for school and didn’t like it very much, but once I saw it on stage, I ended up loving it. I think if I had read it aloud, as you did, I may have enjoyed it more the first time around! I read this in my early twenties and enjoyed it, but you lose something when you read it versus hear it. I would love the chance to see it in person though. Plays are simply meant to be seen and heard. There is a great documentary called ” OT: Our Town” I think. It is about inner city kids putting on the play. Just great Netflix it!